If you have ego-driven product development - data will magnify it. If data serves your confirmation bias - you will always be right but your product will fail. 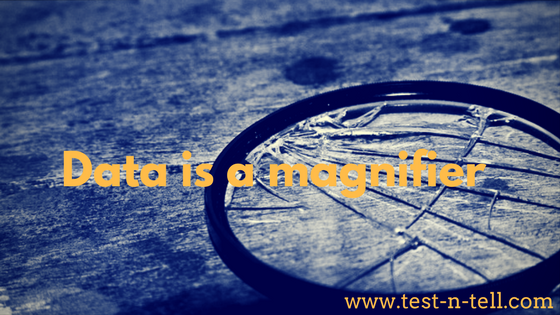 Data is a magnifier of both good and bad. Remember the big promise of data? They said data beats opinions. What happened in reality? Nothing. Those who used to question themselves - doing better with data and those who been arrogant fail despite having endless data. What happened to data-drivenness? Why didn't it delivered a paradise promised? When we seek data only to confirm our already existent belief. And when data is not decisive we interpret doubts to our favor. This is data as an excuse. People have beliefs and choose data to back it up. What could you do to fix that? Start with yourself. Look for data to disprove your belief. Then introduce your peers to the approach. Then be patient. When we have so much data we cannot make a decision. Mantra very much was: as much data as possible. And the more we got, the harder decision making became. When you have only one choice - things relatively simple. Go for it or do nothing. In a case of two choices, you have three possible decisions. And so on. Your mental capacity to make a decision decreases with every additional choice. What can you do about that? Constrain yourself. Set a deadline for yourself to make a decision. Analyze intensively but in due time take the decision. Even if it's not optimal, you can move on, learn and improve in the future. When we accept decision taken by the highest paid individual. Also known as ego-driven decision making. A curious thing happens. HiPPO thinking goes: "I am the highest paid individual here. I am the manager. I am the leader. I should help those people with decision making. Because I should know better. That's why I am in the role and paid as much." And so HiPPO acts in accordance with his best beliefs. What can you do about that? Let HiPPO make the right decision by inception. Navigate discussion towards the right decision but not make it yourself. Allow HiPPO to think it's his decision. Key is a culture of questioning your beliefs. By any means, practices, habits. If you build such culture - data will supercharge it.